Use the disappearing technique to sew this easy Bento Box quilt block pattern. Each large parent block yields four quarters of a Bento Box and when connected they produce two Bento Box blocks. 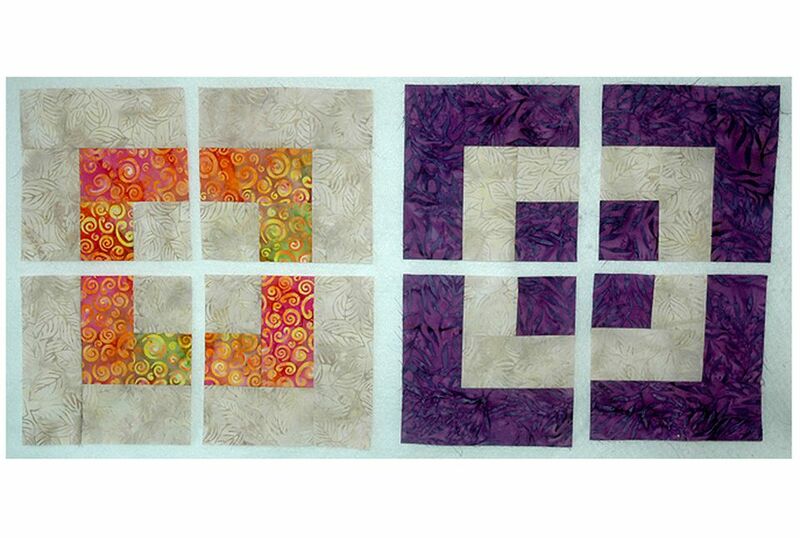 The same technique is used to sew Disappearing Nine Patch quilt blocks. Other patterns converted to the same method include the Disappearing Antique Tile quilt block pattern and a Disappearing Bonnie Scotsman quilt block pattern. The Bento Box parent blocks are a bit like log cabin quilt blocks (the Courthouse Steps variation is closest in looks) but with larger center squares and fewer rows of strips surrounding the center. The trick to making this easy Bento Box method work is to assemble two versions, one of each parent. Contrasting fabrics are placed in opposite positions within the two as shown on this page and on pages 2 and 3. Once assembled, a Bento Box quilt block made from four block quarters finishes at 12 x 12 inches. To make a scrap quilt, use a variety of fabrics to sew the parent blocks. Dark and light strips within each scrappy block can vary as much as you wish. Fabric 2, a second dark (shown as orange/pink -- a bit lighter than Fabric 1, but a warm color that pops into view. Label each fabric. Once you're accustomed to the technique, labels may not be necessary. Sew all seams with a quarter inch seam allowance and press after each step. Make a few blocks one patch at a time until you're accustomed to the method. Once you're comfortable with assembly, cut patches for multiple blocks and use chain piecing to sew the blocks more quickly. Parent 'A' Bento Box quilt blocks begin with a 5 x 5 inch dark center square. Light strips are sewn to sides of the square first, and then dark strips are added. The pressing directions create less bulk in the seams. Alter directions from block-to-block if you prefer. See a photo of the assembly process. Sew a 2 1/2 x 5 inch Fabric 3 (light) strip to opposite sides of the large Fabric 1 (dark) square. Press to set the seam. Press seam allowances towards the square. Sew a 2 1/2 x 9 inch Fabric 3 (light) strip to the remaining two sides of the dark center square. Press seam allowances towards the light ​strips. Sew a 2 1/2 x 9 inch Fabric 1 (dark) strip to opposite sides of the partial block. I like the symmetry that occurs when these strips are added to the edges of the block where the first two (5" long light) strips were sewn, but ​position doesn't really matter. Press seam allowances towards the new strips. Sew a 2 1/2 x 13 inch Fabric 1 (dark) strip to the remaining sides of the quilt block. Press seam allowances towards the new strips. The quilt block should measure 13 x 13 inches. Parent 'B' Bento Box quilt blocks are sewn in exactly the same way as the 'A' blocks, but with fabrics in reversed positions. Begin by sewing 2 1/2 x 5 inch Fabric 2 (dark) strips to two opposite sides of the 5" square Fabric 3 (light) center. Press seam allowances away from the center. Sew 2 1/2 x 9 inch Fabric 2 (dark) strips to remaining sides of the light square. Press seams towards the strips (for me, this created less bulk, but fewer seams butted together when it was time to assemble the block; a good tradeoff for my blocks, but you may wish to alter pressing). Add the 2 1/2 x 9 inch Fabric 3 (light) strips next, followed by the 2 1/2 x 13 inch light strips. Press towards the new strips (or as you've decided to press). Divide each Bento Box parent quilt block into quarters by dividing it once horizontally and once vertically. Each block quarter should measure 6 1/2 x 6 1/2 inches. The two parent blocks will produce two Bento Box quilt blocks. Sew the first block by arranging two sections of each parent into two rows as shown, left. Sew the patchwork in each row together. Press seam allowances in adjoining rows in opposite directions. Join the rows, matching all seam intersections carefully. The Bento Box block should measure 12 1/2 x 12 1/2 inch. Sew the second block in the same way. Sew additional blocks as needed for the type of quilt you wish to make. If you're making a scrap quilt, create more design options by leaving corners as-is until all of your parent blocks are sewn and sliced. Use a design wall or other flat surface to create the quilt layout. Assemble the quilt top (row by row) and finish as desired.